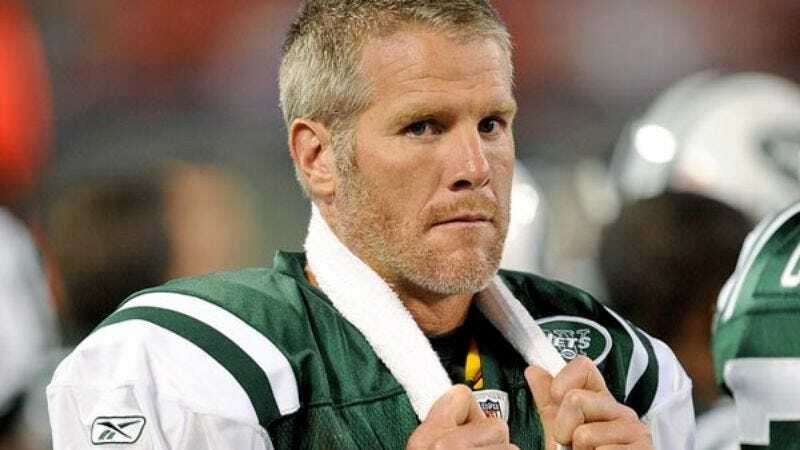 EAST RUTHERFORD, NJ—Although veteran Jets quarterback Brett Favre claims he still loves the game, dwindling enthusiasm and a desire to bow out while on top has him contemplating retirement again, Favre confirmed Monday. "I always told myself I'd know when it was time to walk away," the guaranteed first-ballot Hall of Famer told reporters at the Jets practice facility. "But after 17 or 18, you know, practices as the quarterback of this team, I'm just tired, mentally and physically." Favre's decision to sit out last Thursday's preseason game against the Eagles sparked rumors that Favre was already reconsidering finally hanging up his cleats again. Favre said that, although he had not yet made a decision, he and his wife Deanna had been discussing his possible retirement since he returned from retirement in early August. "I just showed up at camp, looked around at all those young faces, the unfamiliar stadium, thought about the brand new playbook, and I realized I was tired of it all," Favre said. "I love being a football player, I love being a quarterback, and I love being a New York Jet. But one thing Deanna and I have talked about is that I love retirement, too." "At least, I love talking about it," Favre joked. "I guess I have a lot more experience with that than I do actual retirement, now that I think about it." If Favre were to retire this week, the starter for the first game would be third-year pro Kellen Clemens, a strong-armed but untested passer who has backed up Favre for Favre's entire Jet career. "I think he's ready," Favre said, noting that he had been doing his best to mentor Clemens over the past few days. "He's been waiting what seems like forever for his shot, and they can't expect him to just sit around while I take, like, a farewell tour around the league. You have to want it at this level, and I'd say that at this point, he wants it a lot more than I do." In addition to mental fatigue, Favre said rising expectations were putting him under undue pressure. "Face it, last year I went to the conference championship, so the only way for me to be successful here would be for me to win a Super Bowl," the all-time leader in passing touchdowns said. "And that's a tall order. With me out of the picture, though, these guys will have a great season if they can beat Miami twice. So I think, really, that this is best for the fans." Coach Eric Mangini admitted that he had spoken to Favre several times concerning his possible retirement, but would not speculate on the team's future either way. "I told him that only he knew if fatigue was a factor, that he should talk it over with his family, and that I'd respect any decision he made," Mangini said. "A player of his caliber, after everything he's done and with what the name Brett Favre has come represent, it's really no surprise he's tired." "Hell, I'm pretty tired myself, and Brett's only been here a month," Mangini added.